It is very clear that the Ancient Egyptian alphabetical language was the FIRST in the world thousands of years prior the much-to-do-about nothing “Sinai scripts” [see a later chapter about this topic]. In his book The Formation of the Alphabet, W.M. Flinders Petrie has collected and tabulated alphabetical letterforms that extended from the early prehistoric age of Egypt to the Greek and Roman eras. Petrie also compiled (from several independent scholars) similar-looking alphabetical letter-forms from 25 locations in Asia Minor, Greece, Italy, Spain, and other locations throughout Europe. All are much younger than the Ancient Egyptian alphabetical letter-forms. 1. All alphabetical letter-forms were present in Ancient Egypt since early pre-dynastic eras (over 7,000 years ago), prior to any place else in the world. 2. All the Egyptian alphabetical letter-forms are clearly distinguishable in the oldest recovered so-called Egyptian “hieratic writing” more than 5,000 years ago. 3. The same exact Ancient Egyptian alphabetical letter-forms were later adopted and spread to other people throughout the world. Isaac Taylor, in his book The History of the Alphabet, Vol.1, pages 94 and 95, referred to three important Ancient Egyptian manuscripts from the Old and Middle Kingdom eras [2575-1783] prior to the Hyksos period [c.1600 BCE], which had very clear and distinctive alphabetical cursive scripts. 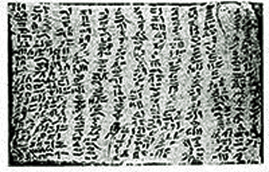 The three papyri agree essentially with each other as to the general style of the writing and the forms of the individual alphabetical characters in neat cursive. These early alphabetical writings [Hieratic] clearly show a true cursive character: black, rounded, and bold. 1. An Egyptian manuscript in the possession of Prof. Lepsius in which mention is made of the builder of the Great Pyramid of Giza, Khufu [Cheops], and other kings of the earlier dynasties of Memphis [2649 -2465 BCE]. 2. The most perfect specimen of the alphabetical neat cursive writing of the early period is the celebrated papyrus which was acquired at Thebes by M. Prisse d’Avennes, given by him to the Bibliotheque Nationale at Paris. This manuscript is usually called the “Papyrus Prisse.” It was published in facsimile by M. Prisse in 1847, and consists of eighteen pages of a magnificent alphabetical cursive writing, unequaled in size and beauty, the characters being unusually large, full, and firm. A statement at the end of the papyrus shows that it is only a copy of the original work, which purports to have been composed by Prince Ptah-Hotep, who lived during the reign of Assa, a king of the fifth dynasty [2465-2323 BCE]. 3. In the Museum at Berlin, there are some fragments of a Hieratic papyrus during the times of the Egyptian kings Amenemhat and Usurtasen, who belonged to the twelfth dynasty [1991-1783] which preceded the invasion of the Hyksos. Here is the Facsimile of papyrus Prisse, where letter-forms look exactly like letter-forms throughout the recognized Ancient Egyptian history and beyond. Here is an enlarged portion of this very Ancient Egyptian papyrus showing distinctive alphabetical letter-forms which every other country will adopt, as the evidence will show throughout this book. 1. Clear alphabets from the Old Kingdom era [2575-2040 BCE] from a letter from a widow, written on linen, Egyptian Museum, Cairo, JE25975. 2. This is the third of a cycle of five hymns to Senwosret III, which was found in the town of el-Lahun. The hymn to Senwosret III shows the strophic arrangement, and was written in mid 12th Dynasty [1991-1783 BCE]. 3. The writing shown here is a memorandum from the Overseer of the temple to the Lector priest at Nubkaura Temple at el-Lahun (during the time of Senwosret II, 1897–1878 BCE), notifying him that Sirius would rise on the 16th day of the 4th month, so as to take note of its exact location and time to enter it into the temple records. 5. 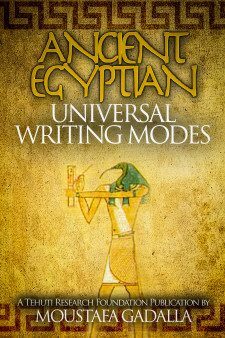 Other Ancient Egyptian papyri with neat alphabetical writings on all kinds of subjects from this very early era are referred to throughout various publications by Moustafa Gadalla and are in most Egyptological references. The BIGGEST smoke screen in history is concealing the (Ancient) Egyptian alphabetical writing system. They made everyone think of the Egyptian language as a collection of “primitive pictures” called hieroglyphics. They concealed the Egyptian alphabetical system as the MOTHER of ALL languages in the world. “Egyptologists have experienced the practical need of adopting some common standard to which different hieratic hands could be reduced, and instead of selecting one simple style of hieratic for the purpose, have preferred to transcribe all hieratic hands into hieroglyphic”. Gardiner’s “explanation/justification” for burying alphabetical [hieratic] writings assures us that there were various forms of writings for various purposes. The very same Western academies NEVER used the same “lame excuse” with Greek, Roman, or any other language in the world! This lame excuse was ONLY used in Egyptian writings to deceive and conceal the Ancient Egyptian’s alphabetical writing language. There is NOT A SINGLE reference—prior to this 19th-20th century “Western Egyptologists” conspiracy—that stated a relationship between hieroglyphics (pictorial signs) and Hieratic/demotic alphabetical letter-forms. On the contrary, EVERY single reference stated EXPLICITLY how unrelated they are. After concealing the (Ancient) Egyptian alphabetical writing system that makes everyone thinks of the Egyptian language as a collection of “primitive pictures” called hieroglyphics, their second blow was declaring that the Ancient Egyptian language is DEAD and that it was replaced—out of thin air—by the “Arabic” language! To say that Egyptians speak “Arabic” is totally false and illogical. It is the other way around: the “Arabs” long ago “adopted” and continue to speak EGYPTIAN. Egyptian is the mother of all Semitic languages, as proven and concluded by ALL academicians.